Load all items of MBOX file with its counts. All emails of MBOX files created by any application like thunderbird, gmail takeout, entourage etc is opened and preview in the tool. Emails will be viewed with all its associated attributes like To, Cc, Bcc, Subject etc. The Software will generate the preview of Attachments along with email, of any selected or loaded file. The generated view of each file consists of email and all type of attachment which includes images, documents, PPTs etc. Open MBOX tool can give you a preview of a single MBOX file or allow you to add a folder containing multiple MBOX files one by one. Hence allow the user to preview bulk MBOX mail with its items. To add MBOX file or folder, use select File or Folder option. 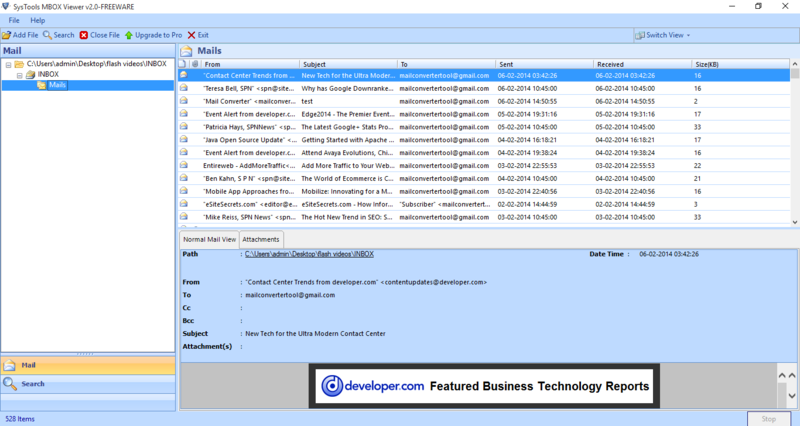 MBOX viewer Software quickly scans all the added MBOX files and make lists of all email items. Also, creates a proper folder structure for easy understandability and provides additional information like file size and date of creation. 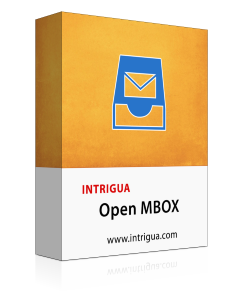 Intrigua’s software to open MBOX file provides you the option to read MBOX mail in two different interfaces. The two options facilitate you to switch the screen mode i.e either to Horizontal view or to Vertical view according to the user’s choice. Intrigua MBOX viewer software has not specified any size limitation to read MBOX file. The tool has the capability to open MBOX mail of any size and preview each and every selected file. MBOX is called as a mailbox which contains all the user mails stored as plain text in a single file. MBOX is a most common format to store mail messages, no limitations on its size are stated anywhere. It saves the mails in a single concatenated text file format one after another. Each mail is started with the word "From" and ends with a blank line. MBOX file can be created with no extension or with extensions like .mbox, .mbx. You can also generate MBOX file of your Gmail account to keep the backup of mails by using Gmail Takeout. 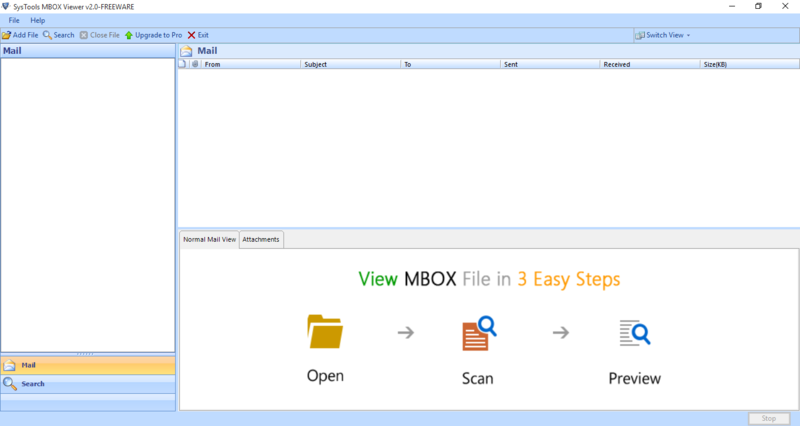 As the MBOX file can be opened only in MBOX supported email applications, so by using this MBOX viewer free utility you can easily read MBOX emails and save them in some different format. To do so you need to upgrade it its pro version. Step 1: Install and Run Open MBOX Software on machine. Step 2: Choose supported email client to view MBOX. Step 3: Add desired MBOX file or folder. Step 4: Preview MBOX Emails along with Attachments. 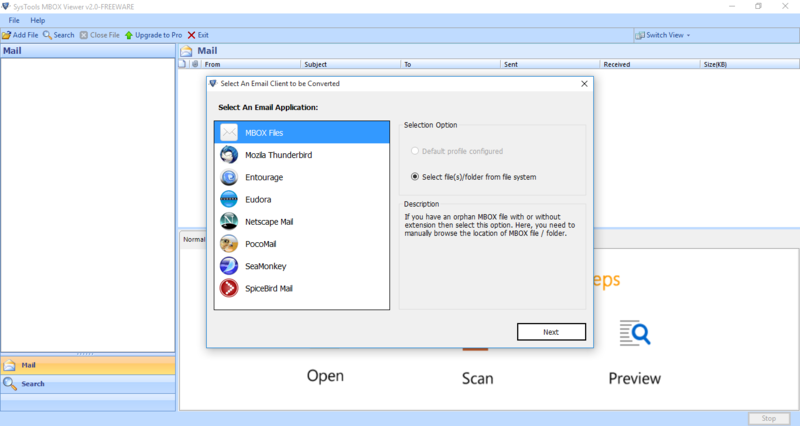 Watch the working of freeware MBOX File Opener to get preview of all emails. What is the MBOX file size limitation which can be added to this software? User can preview or open their numerous mails in the tool as there is no limitation on MBOX file size. Do I need to install any mail application to view MBOX file using this software? No need to install any mail application supported to MBOX. This free MBOX viewer can be used to read MBOX messages without any application. How many MBOX files can be added to the tool at one time? 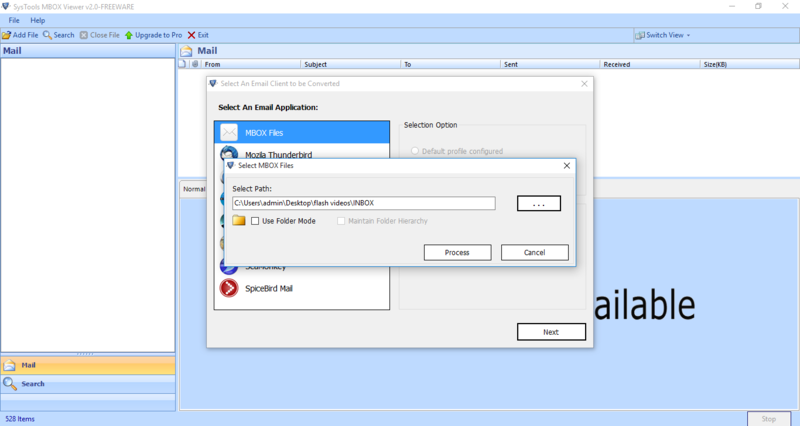 You can add multiple MBOX in the tool, all files should be placed in a single folder and you need to select use folder mode to add all files of folder. Can I use this free utility to read MBOX file in Windows 10? Yes, this software can be downloaded free and installed in any version of Windows(10, 8, 7 etc.) operating system to open and view MBOX emails. I recently changed my email client application and was in need of a tool which allows me to view and open MBOX files. Then, my friend suggested me this Intrigua MBOX viewer software which did exactly what I needed. I was able to read MBOX files along with attachments just in very simple steps. Its a great utility for a novice user like me. Great job! MBOX reader tool is the best tool currently available in the market. The software does a fantastic job to open and view MBOX files created by any email client application like Thunderbird, Eudora etc. It helped me to read MBOX files without any cost and saved my time and effort.